Canada: $10.00. Please pay in Canadian funds (postage included). USA: $10.00. Please pay in US funds (postage included). International money order, cash, cheque, or Paypal. INTL orders: $12.00. Please pay in US funds. International money order, cash, cheque, or Paypal. 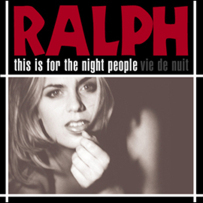 Ralph's fourth album, originally released in 2001. Guest performances by Lauren Agnelli, Bridget Sullivan and Lee Aaron. This is my pal Ralph's CD. I can say proudly there hasn't been a stylistic straightjacket yet designed thet he can't wiggle out of. There is a pleasure I derive from listening to Ralph. He's as accomplished as he is witty. Every word is perfectly balanced and seemingly effortless. Ralph has a passion for many of the great aural architects of the past such as Allen Ginsberg, Jack Kerouac, Lawrence Ferlinghetti, Lord Buckley and Ken Nordine, but he has more than enough talent to make you forget his influences. He's a stylist whose balance of pieces is deliciously elaborate, fanciful, and simply stated. This CD is truly an aural calling card of warmth that doesn't cut back on smarts or passion. If you're reading this in your Manhattan penthouse apartment, sitting at your computer in your smoking jacket, martini by your side, looking for the Vargas girl in the next Esquire and longing to get in touch with your inner-Beat, Ralph's your man. Ralph's a descendant of the berets-and-bongos set of the late-50's/early '60s, walking down the trail blazed by Word Jazz guru Ken Nordine and others. Backed by smoky retro jazz sounds, Ralph has the right rhythm and vocal presence to stylishly pull off the narrative vocalizing trip. He also pens some nice lyrics that pay tribute to the tradition he works in, but don't overdo it. Most of the songs are pithy snapshots. On a couple numbers he pays eloquent tribute to New York City, the songs obviously gaining extra resonance in light of the September 11 terrorist attacks. The album develops a feel somewhat akin to a Raymond Carver collection of short stories - the combined weight of the songs gives the disc a certain life of its own, each track building on the noir ambience. Lauren (Washington Squares, Nervus Rex) Agnelli and Lee Aaron guest. A poetical jazzy landscape. The music is crawling its way towards the listener. It's a touch of early Tom Waits, some of the excellent and moody Chet Baker, 50's beat poetry with Jack Kerouac as a close reference and mostly some of their own flavour and spices. On the 1:03 long track seven they even get a bit bluesy and gospel sounding. Track 11 "Staten Island for two" bear a clear resemblance to the mood that Tom Waits creates on his "The Heart of Saturday Night" album. It's hard to say what songs I prefer the most on this album, but as a whole it's an excellent album. Ralph Alfonso's extraordinary combo conjure up an entire Greenwich Village tableau on their latest foray into the dusky twilight world of the beat poets, the jazz bohos and a golden era when a smoky saxophone and a muted trumpet blowing over the rooftops was just a funny Valentine. Skipping like daisies over songs dedicated to John Coltrane, Paul Desmond and Jack Kerouac, Ralph manage to be heaps of fun as they take the listener on a rare and worthwhile journey. Fans of such desirable punk poets as Kerouac, Ferlinghetti and Ginsberg will dig the style of lyricist Ralph Alfonso. The melancholic "Last Year's Valentine" is perfect for all those recently broken hearted. The album draws upon Alfonso's personal journey in New York City, describing its village sounds and how perfect the world can be kissing the one you love in NYC listening to John Coltrane, or going the wrong way on the Staten Island Ferry. Put ya feet up, spark up and pour a large one. Jazzy and deliciously comic. Hearty imbibers of cigarettes, prohibitively caffeinated java and love affairs not so much doomed as miraculous for ever having existed will enjoy Ralph Alfonso's journey into the centre of Beat-era jazz. "I think I'm allergic to life, personally," drawls the Canadian don of smoke-soaked existential musings, "but as long as I've got a car, then I've got someplace to go." Highly suitable for driving in torrential rain, dumping/being dumped, seducing, lounging. The Night People CD has received airplay on Radio Ceredigion, Wales (Phyl Olyott Program). Niiiice downtempo smoky jazz with spoken words. Running bass leads into the singer taking on the persona of Dean Moriarty leaving sad Sal standing by the roadside as he bombs off in a Cadillac with his latest girl. Breathy mature good ol' boy vocal from Ralph on this catchy country blues. Smokey saxophone leads the laid back middle eight. A haunting mixture of moody jazz, soft spoken, cigarette burned poetry and exquisite lyrics, this fourth release by Ralph is cool, dark and heady. Vocalist and lyricist Ralph Alfonso leads an impressive combination of musicians and instruments in a swirl of spoken word beat dreams. The odes to the beats, from finger snaps, sax solos, hi-hats and obscure haiku on "John Coltrane / New York City" to the rendition of the Ginsberg/Kerouac "Pull My Daisy", breezes though the album like smoke from a wet pair of ravaged lungs, full of life and staggering like a drunk through the streets. Almost every poem-song is a heart broken salute to cigarettes, NYC, jazz and dark grey clouds hovering gloomily overhead. In so many ways utterly cool and accomplished, Ralph can pull off an excellent album without a trace of pretension or self-parody. Perfect for nights when you're feeling too cool to even leave the house. ...this is fine company for late and lonely nights. Ross Porter provides the liner notes, and the tunes name-check fond places in Ralph's heart (Montreal, New York, Ottawa) and classic names spinning on his turntable (Oscar Peterson, John Coltrane, Eric Dolphy). These days, Ralph and his shifting group of players have this niche pretty well all to themselves. One track, "John Coltrane New York City", speaks for this entire disc. Jazz poet Ralph Alfonso, the only living beatnik in Vancouver, recites his lyrics as if he were sitting in the Village Vanguard circa 1961, his best girl at his side, listening to John Coltrane's great quartet. During the track, John Cody bashes at cymbals and saxophonist Graham Howell, who should be awarded a medal for bravery, attempts to invoke the Trane on his horn. In all, the disc has 24 tracks, mostly of Alfonso's spoken poetry accompanied by a jazz combo. "God Shine Your Light on My Corner Tonight" has a gospel flavour, and "Nostalgia for Nowhere" captures a bilingual Ralph reciting the lyrics in French. You don't need a poetry pedigree to enjoy this record, though it helps to be a jazz fan. Ralph Alfonso keeps the spirit of the Beat Generation alive and well on this ambitious spoken word release. His atmospheric poetry, redolent of the wild counter-culture spirit of the 1950s and pre hippie 60s, is delivered by the author in his gruff, expressive voice and backed by a combo with a tight crime-jazz mood. To be honest, Ralph's aesthetic owes more to the rain-soaked, neon-lit prose of Raymond Chandler as it does to Ginsberg, Ferlinghetti, Kerouac and Co. "That's What Lonely People Do" bridges the gap between beat and noir with its taut, well-chosen words. Alfonso's odes to the 50s gods of modern jazz are apt and intelligent. Mixed in with Ralph's poetry are some vocals and instrumentals written and performed by others, including Lauren Agnelli and Michael Rummen. An early effort by Mick jagger and Keith Richard closes this eclectic disc. Being more dense than most pop songs, Ralph's lyrics are best enjoyed in small doses. This 24 track disc has the listening enjoyment of four or five albums. An unusual and pleasing disc, nicely recorded and performed by all involved. Ralph est le groupe du leader Ralph Alfonso qui nous offre des poèmes pour la nuit dits et chantés dans une ambiance nocturne des plus prenante sur fond de ténor ou de flûte, avec de bons musiciens au feeling ad hoc. Ses maîtres en poésie sont les poètes de la Beat Generation. Les textes sont de lui, sauf «Pull My Daisy» de Ginsberg/Kerouac/ Amran. A noter un long et bel hommage à Coltrane «John Coltrane New York City». Trois chanteuses de style différent apparaissent chacune pour un titre, ajoutant quelques gouttes de nuit autres. On a même un «Nostalgia for Nowhere» dit avec conviction par Ralph en français et «23 Bridges» chanté en français par une voix féminine et dit en anglais par Ralph: c'est très beau. Les morceaux 1, 2, 5, 8, 9, 11 sont tirés de la bande du film «Vie de nuit» de Hot Chris Hooper. © Jazz habitées, habitées par l'amour, la poésie, la nostalgie, et bercées par le blues. Les paroles sont données sur le livret, ce qui ajoute au plaisir. Ralph is Ralph Alfonso's band, which offers us poems for night people, both sung and spoken-word. These pieces, destined for a notcurnal crowd are very catchy and have a nice backing of tenor, flute, with a good improvised feel from the musicians. Ralph's mentors are from the Beat Generation. All the poems are his, except for "Pull My Daisy" which is from Ginsberg/Kerouac/Amran. Also notable is a nice, long tribute to John Coltrane, "John Coltrane New York City". We're also treated to three female singers that each bring a different feel and their own touches on the record. Ralph also gives us an honest effort in French on "Nostalgia for Nowhere" as well as "23 Bridges", sung in French and spoken in English by Ralph. Very nice. Tracks 1,2,5,8,9 and 11 come from Chris Hooper's short film "Vie De Nuit"
This record has all the charm of those Jazz nights, filled with love, poetry and slowly rocked by the blues. To top it all off, the booklet included with the album gives us the lyrics.